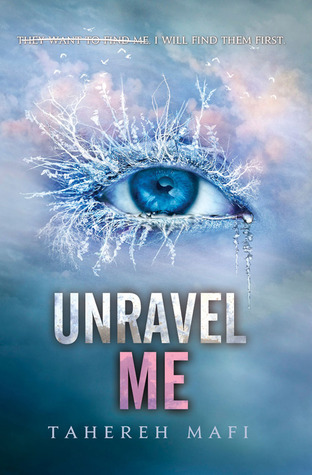 Unravel Me is written by Tahereh Mafi and narrated by Kate Simses and is the second book of the Shatter Me series. 1. I really enjoy the world that Mafi has created in this series. She has some excellent world building in this book with both the Reestablishment and the Omega Point. I do love a good dystopian world and quite what Mafi does in this book with that genre. 2. I have to say that I found Juliette and Adam to be the most annoying characters in this book. They were so terribly angsty that I could hardly handle it. There were multiple times that I just wanted to slap them, especially Juliette and say pull yourself together. The other characters were much more interesting. And I definitely enjoyed Juliette's interactions with Kenji way more than anything with Adam. 3. Speaking of Kenji, I adore him. He is hilarious, and can be pretty smart. I love when he tells Juliette to man up and then he does things to pull her out of her shell. I just want a whole book devoted to him honestly. 4. There are some interesting revelations in this book. One of which makes the love triangle between Juliette, Adam, and Warner a little strange. I am interested to see how it plays out, and hope that the ending means that Juliette will be less annoying in the next book.